Pensacola Sound Chorus, 2017 Region 9 Most Improved Chorus, is eager to entertain you. The chorus delivers Singing Telegrams for that special someone any time of the year; Christmas, birthday, Valentines, etc. Pensacola Sound Chorus offers a quality music program with a variety of uptunes, swing tempos and sentimental ballads, appealing to all generations. 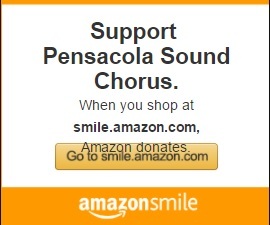 Since Pensacola Sound Chorus is an a cappella group, a place to stand is all that is required. We can tailor the size of the performing group to meet space limitations. Whether it’s a private party or a public event, Pensacola Sound Chorus is available to meet any organization’s entertainment needs while staying within entertainment budgets. Our Chapter Quartets That Other Quartet and Blondish are all available for bookings!